You are never to old to play with color. Color is the new black. That is what I’ve been saying all summer long. Lately, I’ve been a little more adventurous, trying out the color blocking trend on my nails. I started with the coral and navy shown above. One important thing to keep in mind with this trend is to color block with colors on the opposite side of the color wheel. Without even knowing it, I found out Kristin was doing the same. I caught this pic via our LoveFeast_Table Instagram account. Sometimes even BFFs are forced to find out what the other is doing via social media. 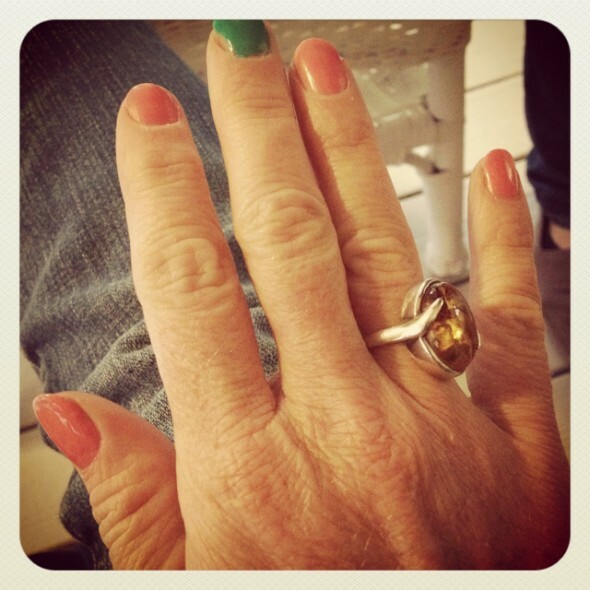 I found out that Kristin’s daughter was painting her nails in similar shades. That’s the power of BFF mind-meld. After I returned home from my recent trip to Colorado. I tweeted this. You might be thinking what does that tweet have to do with anything? Well, I am happy to be alive. You only live once. And, maybe because of that, I was inspired to do an 80’s cotton candy pink which is on my nails now. 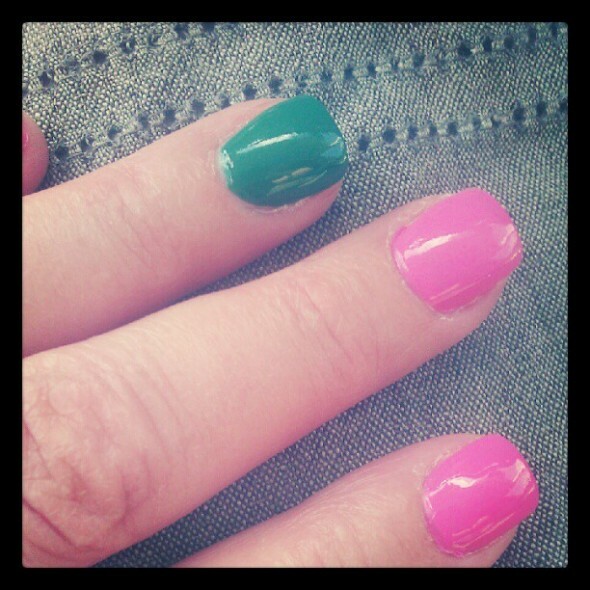 I did the pop of pink with green on my ring fingers. And, all green on all ten toes. I think the way to do this nail trend, is keep it simple. Either color block your hands or your feet to keep it sophisticated. To a degree that is what makes color-blocking modern, minimalism. I’ll let the cat out of the bag. I’m in my 40’s – ish. Yes, I know this pink is shocking. But, like I said, I’m alive. And now my nails prove it. Compliments from the pool girl and the gal behind the counter at Jimmy Johns, I’ll take them. 1.) Choose shades on the opposite end of the color wheel. 2.) Emphasize either fingers or toes to keep it the look sophisticated and polished. hee!hee! 3.) Check out more nail inspiration and this similar color block polished look HERE found at Oh So Pretty the diaries and their Mani Mondays. What about you? What’s your fav nail color right now? 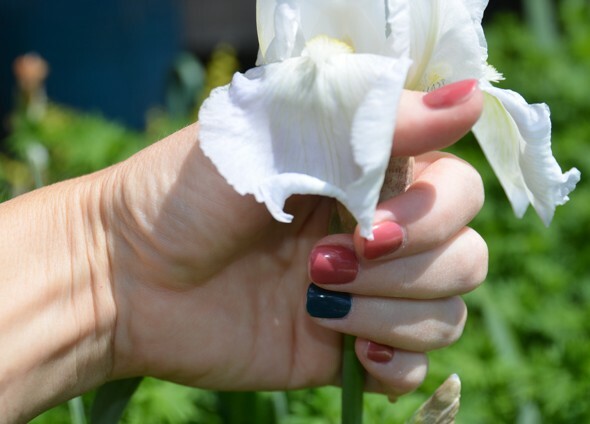 How do you like the Color Block Polished Nail trend? love it! must give it a try!